He is one of the most emblematic, and cinematographic, figures of American Catholicism: patriot, scientist, theologian, journalist, an a key player intellectual in the history of two nations. The priest venerated by his contemporaries, considered a saint in life, remains an enigma, a rare talisman to which a few cling, like Auxiliary Bishop Octavio Cisneros, who was the speaker of the evening “Félix Varela, On the 230th Anniversary of His birth,” organized by the Cuban Cultural Center of New York, and celebrated Nov. 20 in the Church of the Transfiguration, Manhattan. The stage is perfect for a Gangs of New York prequel. In 1827, few years before the time in which the Scorsese film is set (1846-62), Father Félix Varela y Morales, a Cuban exile, founded the parish of the Church of the Immigrants – which later became the Church of the Transfiguration – to help the impoverish Irish Catholics population in the area of The Five Points. Nowadays, by the grace of multiculturalism and globalization, and because Manhattan is a beast that mutates faces to the rhythm of every immigration, the temple beats in the heart of the colorful Chinatown. In the church whose austere architecture is reminiscent of an evangelical temple, the evening was devoted to celebrate an extraordinary man, whose ascent to the altars was anticipated a few years after his death when José Martí, the apostle of Cuban independence, said in front of his grave: “Here rests the Cuban saint,” and from whose cause of canonization, Bishop Cisneros is vice postulator. 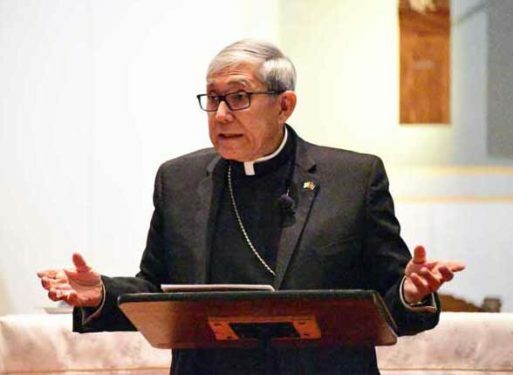 “Venerable Varela is a saint who expects a miracle,” Bishop Cisneros said stonily, answering the obligatory inquiry about the current state of his canonization process. For his keynote address, Bishop Cisneros drew on the notes of Bishop Raúl del Valle, one of Varela’s biographers, and another Cuban priest who left his mark in New York Catholic life, being the “first chancellor of the Archdiocese born in Latin America,” from 1985 until his death in 1988, 30 years ago – Father Varela was Vicar General, when New York was still a diocese from 1837 to 1848. Although the conference was in Spanish — scattered by some comments in English and a simultaneous translation service, a considerable part of the audience was Anglophone — some of them Americans of Irish descent interested in the life of the Cuban saint who was a devoted pastor of the Irish a century ago. Father Varela was so dedicated to his religious services to the Irishmen that his presence in the New York of the early nineteenth Century was certainly transformative. Not only did he found this Transfiguration parish, and several catholic newspapers, but also to employ poor young Irish immigrants and protected them from prostitution created a daycare and a clothes-making cooperative. One anecdote enough to show the veneration he received from the Irish community tell how they protected him from the loose assassin, the one-eyed ‘tuerto’ Morejón, paid by the Spanish governor of Havana to kill him, who had to return to the island without fulfilling his mission. Despite being a descendant of a military caste — his grandfather was the lieutenant general and military commander of Florida when it was a Spanish possession — Bishop Cisneros recalled that Venerable Varela discovered his vocation early on, and faced with the dilemma of pursuing a military career, he replied to his grandfather: “I want to be a soldier of Christ. My purpose is not to kill men but to save souls.” A mission that he would meticulously fulfill the rest of his life.